How to make Rob Bagnall grin from ear to ear? Just produce a tour brochure this good! Shaun Webb has done a great job this time around on the new tour brochure. 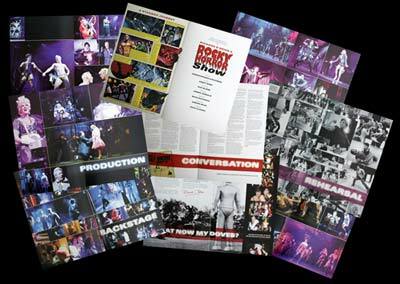 Labelled Richard O'Brien's Rocky Horror Show Picture Book this is a beautiful 20 page brochure. The Picture Book is 340mm x 220mm (13.25 x 8.75 inches in old money) with the red lettering in a nice metallic effect. Packed to bursting with images, images and more images from the production the brochure also features a nice comic style synopsis of the story on the inside front cover, nicely illustrated by Leigh Gallagher. As well as the usual production images (from the dress rehearsal at Brighton) which run to eight pages, there is also a nice double spread of images taken at the rehearsal rooms in London, just a stones throw from Highbury and Islington tube station. There is also a double spread of images taken backstage at the dress rehearsal in Brighton. Main production images are by Eric Richmond and the rehearsal and backstage images are by Shaun Webb himself. The Picture Book also features a nice two page transcript of a conversation between Richard O'Brien and director Christopher Luscombe on 25th February 2006. There is also a final text from Richard O'Brien which I won't spoil for you by reprinting here. To round off the Picture Book, there is a nice half page of images of the fans at the show and a line from Stephanie about the fan club (the last piece of text in the book is www.timewarp.org.uk). Well I've seen a lot of brochures over the years, this one has got to be one of the most thought out, well produced ever. A round of applause to Shaun Webb I think. 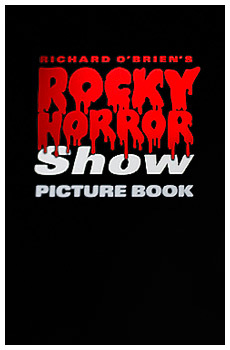 Currently only available to buy at the Rocky Horror UK stage show venues during performances, the Picture Books are £8 each and worth every penny! There is now a new version of the book available from Ipswich 2007 with updated images of the 2007 cast, everything else remains the same. General opinion from the fans is the first brochures had the better images. Picture Book composite image of pages and cover image used for purpose of this review only.